It’s slightly sad to think that the teenage gamers of today won’t have a clue who the Bonanza Brothers, Opa Opa and Alex Kidd are. That said, I consider myself to be a Sega buff and I had to Google the names of unlockable characters ‘Zobio and Zobiko’ to find out what game they’re from. Turns out the zombified duo are from The House of the Dead: EX, an arcade game released only last year. If that’s not fan service, then I don’t know what is. 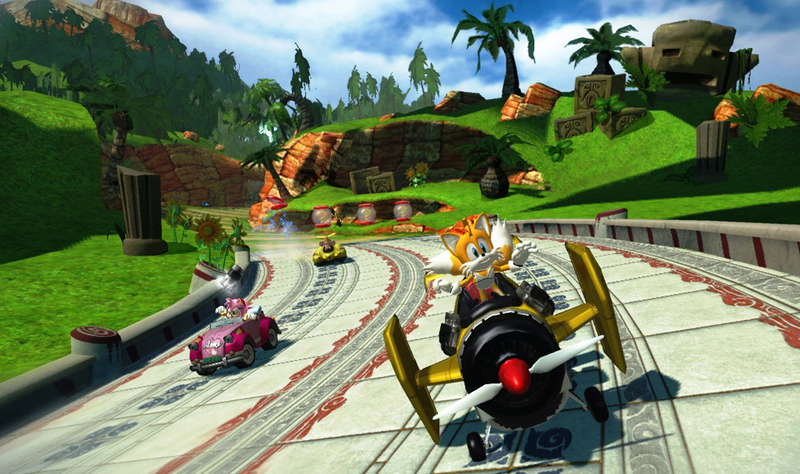 Understand, understand, understand the concept, the concept of….Sonic & SEGA All-Stars Racing. Like Sonic himself it’s a brightly coloured affair that moves like a greased rocket. Sonic’s tracks have been designed for sheer speed, Samba de Amigo’s bare resemblance to Mario Kart’s Rainbow Road while the Monkey Ball tracks are the toughest due to some harsh 90 and 180 degree corners. The House of the Dead, sorry, Curien Mansion, tracks have zombies aimlessly hobbling around and Billy Hatcher’s assortment provide the as-to-be-expected ice and lava lands. There’s a huge emphasis on power sliding to gain boosts, which is achieved by holding down the left trigger. The same button is also used to perform tricks when in the air. In the early Mario Kart games the weapons where perfectly balanced. Mario Kart Wii though messed things up with its unavoidable blue shell and blooper ink that smothered the screen. Thankfully there’s nothing inescapable here – the screen can be covered with an obscuring rainbow effect, but only if you’re careless enough drive into a rainbow that somebody has dropped behind. The rest of the weapon assortment includes Sonic’s sneakers as a speed boost, a couple of projectiles (Alex Kidd’s boxing gloves and rockets from Chu Chu Rocket) and a bomb that you can bowl down the track. Do poorly in races and eventually you’ll get a power-up to go ‘All-Star’ and perform an attack unique to each character. Jet Set/Grind Radio’s Beat leaps out of his car and onto his skates and starts spraying other racers with paint; Big the Cat turns into a giant frog and leaps his way to victory. Funnily enough, Eggman always seems to be in last place. Winning races and beating the mission modes – which include knockout races, and races involving hitting targets – unlocks Sega Miles that can be spent on new characters and music tracks, including rifts from Sonic R and Sonic CD. There are 64 missions to beat which only start getting difficult around the halfway mark. The achievements are fun to unlock too with most of them being named after classic Sega games. Cross the finish line backwards to get the Wonder Boy achievement; win a race with no collisions to get the Project Rub one. If Sega haven’t sent Sumo Digital a nice big bonus cheque for doing such a good job on this one, then they bloody well ought to. The only bad thing is that the commentator soon becomes annoying, although I did childishly laugh when hearing him say “Big the Cat can give it as good as he takes”.